There’s an almost sci-fi like fascination with building “cars” that can lean into corners. Mercedes built a concept car years ago where the front tires lean when you turn. Piaggio has a scooter that does it. It’s just not very practical and the engineering involved seems intense. But Carver Europe (formerly known as Vandenbrink after Chris van den Brink who co-developed the technology behind this car with Harry Kroonen) managed to bring one to market. 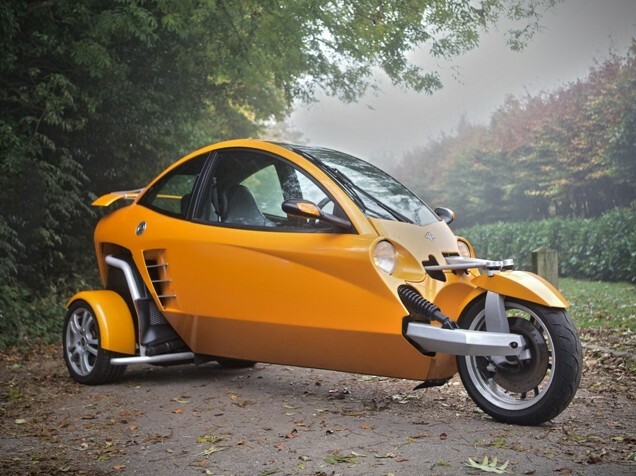 It’s a three-wheeler, which in many countries technically classifies it as a motorcycle (even though it has a roof and doors). The engine is mounted out back and is a 660cc turbo straight-four making 65 horsepower. Might not sound like much, but it’s enough to get up to 115 mph. The passenger compartment has self-leveling technology that allows the body to swing in the corners (think of it as leaning into the turn) to give you a very jet fighter-esque experience. The Carver originally went on sale in the early 2000s, probably in 2002. But due to a nearly €30,000 price tag as-new, demand was low and the company went belly-up in 2009. Only about 200 were ever made and this one should sell for between $16,000-$22,000. Click here for more info and here for more from this sale.